It was on this day in 1939 that Lou Gehrig’s consecutive games streak ended. The streak was halted at 2,130 after Gehrig sat out a game against the Detroit Tigers, which the Yankees would go on to win by a score of 22-2. Gehrig’s consecutive games streak would be one of his greatest achievements and perhaps the most notable highlight of his career. He became known for his durability and perseverance, as his streak saw him play through several injuries. For example, on July 13, 1934, Gehrig suffered a “lumbago attack” and had to be assisted off the field. The following day he was listed at shortstop and batted in the lead-off position. Following his first at bat of the game, he was replaced and given the rest of the game off to heal his aching back. Gehrig’s record would stand until September 6, 1995, when Cal Ripken Jr. of the Baltimore Orioles played in his 2,131 consecutive game. When Gehrig first established his record of 2,130 consecutive games, many thought it would never be broken. Despite that not being the case, it did stand for a remarkable 56 years. 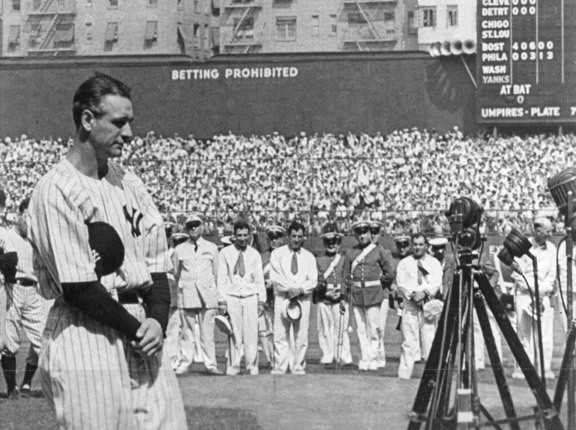 Here is a look at Gehrig’s farewell speech.